Unite your multicultural community with this contemplative, trilingual collection of English, Spanish and Vietnamese songs — featuring music for the liturgy and various rites throughout the liturgical year. A peaceful and contemplative collection, My God and My All features 10 songs in a mix of English-only and various combinations of English, Spanish and Vietnamese. 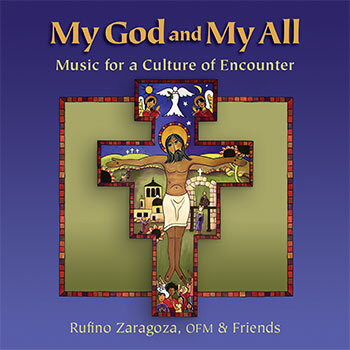 With compositions spanning four decades, Franciscan Brother Rufino Zaragoza collaborated with Vietnamese- and Spanish-speaking composers to translate and compile a collection of songs for use in multicultural celebrations throughout the liturgical year — including weddings, funerals, baptisms and Communion. Featuring three distinct languages, this collection invites faith-filled members of the congregation to unite in song. And with many well-known tunes, — “Radiant Light Divine,” “Cầu Cho Cha Mẹ 2/Prayer for Parents 2” and “My God and My All” — communities of faith will instantly recognize and enjoy the music together. With an English translation from Rufino, this song comes from the second part in a series of ten “Prayers for Parents” that Phanxicô composed throughout the 1980s for children’s Masses in Saigon, given the long tradition of ancestor veneration. Written in Western tonal style with a slight touch of Vietnamese styling, it is most suitable for a children’s or teenagers’ choral ensemble for First Communion and Confirmation. Adults may also use this song for weddings, funerals, Feast of the Holy Family and the Lunar New Year. This piece, intended for use during the Sprinkling Rite, was composed to meet the need of parishes for music that welcomes the Vietnamese and Filipino communities. It features a quadrilingual refrain and an alternate trilingual refrain that includes only one phrase in Vietnamese. The Filipino and Vietnamese verses have melodies that accommodate the tonality of their native language and differ from the English and Spanish verses. This is the fifth version of the octavo “My God and My All.” First released in 1990, followed by Spanish and Vietnamese additions in 1998 and 2000 respectively, this intercultural octavo unites three very distinct languages. It now features a new SATB choral arrangement, a descant for the fifth verse (in all three languages) and a C instrument part.